What is your “gold” content? It is my firm belief that the bumps and scars of life are what makes each of us valuable. Our experiences and lessons along the way may have left us a bit tattered feeling, and maybe a bit rougher around the edges, yet it is these very things that enhance the depth of who we are. None of us are without our cracks yet it is what we choose to fill these with and the care we take in repairing ourselves through our experiences that adds to our personal value. We can choose to improve and add value to who we are, and what we have to offer, or we can become embittered and let “poor me” attitudes cloud our judgement and cause us to live in the past thinking only of regret, frustration or anger. There is an old saying that the cracked vase is more beautiful because of what makes it unique and more valuable for this uniqueness as well. I found out that it is more than just a saying it is actually an ancient philosophy. One we could benefit from more so in much of our society often ruled by judgement and pessimism. 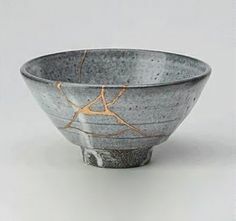 Kintsugi consists of repairing broken pottery with lacquer mixed with a powdered precious metal such as gold. Also known as golden joinery it is a form of Japanese art that treats breakage and repair of an item as part of its history rather than something to disguise or, more drastically yet, discard. So it can be with each of us. What precious material can you repair yourself with?If you have a wounded heart, fill it with love. If your body is bruised, repair it with acceptance and gentleness. If you have a hole in your faith or belief coax it back to wholeness with trust and truth. I choose to look at the gifts of the experience of life as much as possible and encourage you, dear readers, to do the same. It is not always easy but the treasures of this grateful attitude are plentiful. It has taken me a very long time to accept many of my own scars, those visible as well as those that are not, for the gift they are. I am pleased to claim that in this NOW I find myself smiling and proud of who I am. I have often said that I accept myself and these words came easy however it was only very recently that I have come to love myself for the very makeup that my personal bumps and scars have granted me. My gold content is high. How’s yours?